A judge ordered the former Trump campaign chief transferred to a new jail while he awaits trial. 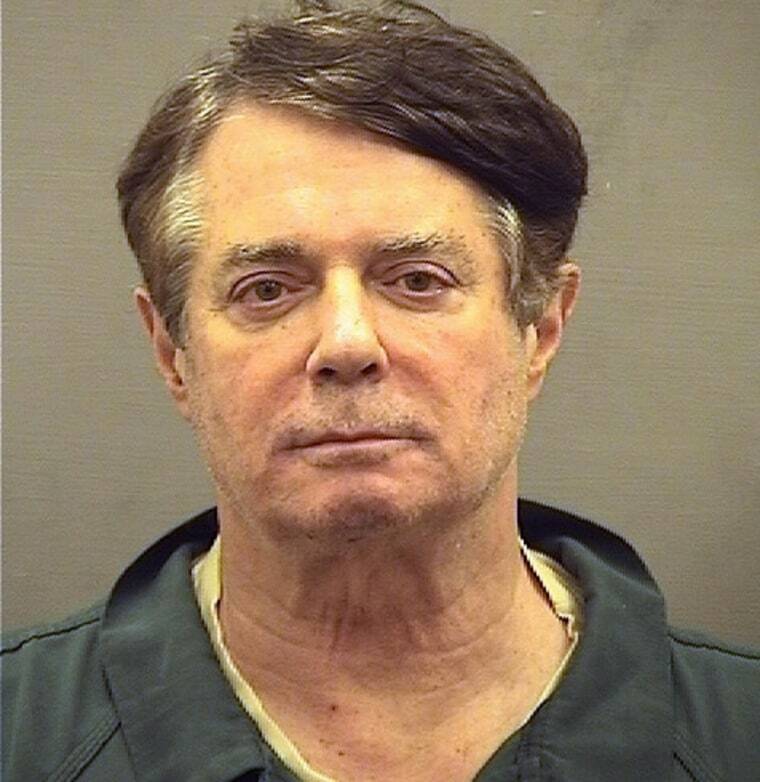 Former Trump campaign chief Paul Manafort has been transferred against his wishes to a new Virginia lockup — which issued a mugshot showing him in a green jail jumpsuit with a scruffy face. Earlier this week, a federal judge ordered Manafort moved from the remote Northern Neck Regional Jail to the Alexandria Detention Center after his legal team complained that the distance and restrictions of the first facility would impair his ability to prepare for trial on charges brought by special counsel Robert Mueller. Manafort, who had raised the issues in hopes of getting the first of his two trials delayed, quickly objected to the transfer and said in court papers that adjusting to a new place would be too disruptive and distracting. The judge held firm and insisted that U.S. marshals make the switch. Alexandria Sheriff Dana Lawhorne said Manafort was booked into the detention center on Thursday. "Because he is a high-profile inmate, Mr. Manafort will be placed in protective custody which limits his interactions with other inmates," Lawhorne said. "Specific details about Mr. Manafort's confinement will not be made public due to security and privacy concerns. We will work closely with the U.S. Marshals to ensure his proper care while he remains in our custody." The booking photo, however, does confirm one detail: Manafort will have to wear the same uniform as the rest of the inmates. That's notable because Mueller's team said in a court filing Wednesday that Manafort was not required to wear standard prison-issue clothing while at Northern Neck. They also said Manafort had a phone and laptop in his one-man housing unit, had figured out a way to get his attorneys to transmit emails from him, and boasted that he was treated like a "VIP." Northern Neck Superintendent Ted Hull told NBC News that since the Mueller filing, he's received hate mail and angry calls from members of the public accusing him of giving Manafort special treatment. "I had one woman call me and say I'm on the Russian payroll," Hull said incredulously. "Nothing about his incarceration is plush and nothing is privileges. Any deviation was to my benefit, not his." He said Manafort was held under the same conditions as two previous high-profile inmates — former NFL star Michael Vick and singer Chris Brown — in a self-contained unit with its own shower and toilet. All inmates have phone privileges, he said, and some get laptops to assist with trial prep. Nothing about his incarceration is plush and nothing is privileges. Any deviation was to my benefit, not his. "He got what I deemed to be appropriate precautions associated with his notoriety," Manafort said. "He got treated the same way I treated Chris Brown or Michael Vick." Manafort was allowed to wear prison-issue civilian clothes so he would have a lower profile as he was moved throughout the 500-bed jail, Hull said. He said when he learned Manafort was using a non-approved attorney laptop, he told the legal team to stop it, and he did not find out they were allegedly transmitting emails he wrote until this week. Manafort is awaiting separate trials in Washington and Virginia on charges stemming from his business dealings and Ukraine lobbying work — alleged crimes uncovered by Mueller while he was investigating Russian meddling in the 2016 election. His bail was revoked after prosecutors accused him of witness tampering while he was on house arrest.